Fresh, flowing water and a fluid balance are vitally important for your cat's health, helping to support healthy kidneys and combat infections in the urinary tract. Whether your cat is young or old, the Catit 2.0 Flower Fountain can be an extremely beneficial drinking solution for cats that struggle to drink enough water. The Catit 2.0 Flower Fountain set includes a drinking fountain and a triple action filter that offers your cat flowing, oxygen-rich water and encourages it to drink. The water flows through three different levels so that your cat can drink to its heart's desire from wherever it chooses. It can decide between a smooth or calm flow and a more energetic, gushing water source. The Catit 2. 0 Flower Fountain also features a compact and ergonomic design. Inside you will find a large, opaque reservoir that can store up to 3 litres of water without taking up exceΒive amounts of space. The comfortable height makes the flower fountain perfect for kittens as well as adult cats. The double-function filter found inside the Catit 2. 0 Flower Fountain (replacement filters can be purchased separately) softens hard tap water as well as filtering out hairs, food waste, impurities and sediment. 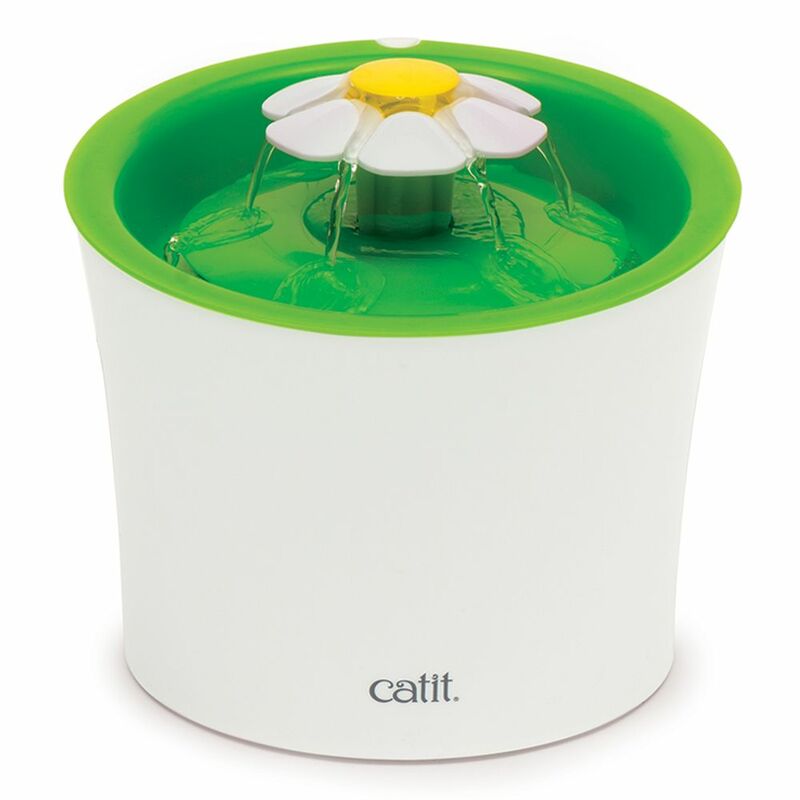 In spite of the many functions of the Catit 2.0 Flower Fountain, it is extremely easy to set up and to clean. Simply clean each individual section with a neutral soap free from chemicals and scouring agents, then rinse by hand. You will quickly find that the Catit 2.0 Flower Fountain works wonders on your cat's wellbeing! Catit 2.0 Flower Fountain at a glance: Drinking fountain for cats of any ages, with plenty of drinking options Encourages drinking: an increased water intake is great for keeping kidneys functioning healthily and for combating urinary illneΒ 3 different flow settings: smooth, calm and gushing Compact, ergonomic design: takes up little room and is at a comfortable height for both small and large cats Contents: drinking fountain with pump and filter Filter: water-softening double function filter Dimensions: 13. 9 x 1.4 x 13.9 cm (L x W x H) Replacement cleaning filters (double action) can be purchased separately Cable length: 1. 4m Pump: energy requirements: voltage 3.5-9/1-3W Material: plastic Capacity: 3l Dimensions: 21 x 20 x 21 cm (L x W x H) Colour: white, green Cleaning the Drinking Fountain: Wash the drinking fountain once a week with a soft sponge and a mild detergent. Please take steps to ensure that no traces of soap are left behind. Cleaning the Filter: Remove the filter from the bottom compartment and clean it. Do not wash the filter with soap. The foam mats within the filter should also be cleaned because otherwise water will no longer flow through it. If the filter contains impurities or other foreign substances, you will need to replace it. (Replacement filters are sold separately.) Replace the filter every three weeks or when it becomes saturated with foreign substances (impurities, food remains, hair, etc.) Having to..